MELT enviro-blend ice melter provides a greener, yet equally effective, deicing alternative to more harmful melting agents. When used as directed, MELT enviro-blend will not harm grass, wood, concrete, metals or other vegetation and is safer for pets, children and the environment. MELT enviro-blend exhibits the following properties: ANTI-CORROSION FORMULA: Enhanced with CMA (calcium magnesium acetate), an environmentally benign deicing agent, MELT enviro-blend ice melter delivers fast and effective results without damaging metal surfaces, such as the exteriors of cars, trucks and other equipment. FAST ACTING: MELT enviro-blend goes to work immediately upon contact with snow and ice to accelerate the deicing and melting process. Pre-treating surfaces with MELT enviro-blend will also prevent ice and snow from accumulating. LONG LASTING :MELT enviro-blend time-relaxed formula stays on the surface area longer for added protection and better control of the freeze/thaw cycle. MELT 50 Lb. Resealable Bag Calcium Chloride Crystals Ice Melter MELT is a unique formulation of calcium chloride crystals that are super-enhanced with extenders for long-lasting traction control. MELT is designed to quickly, safely and effectively tackle frozen snow, sleet and ice around your property during the winter season. Packaged in a convenient dispenser jug, MELT can be conveniently dispensed directly out of the jug and onto the surface to be de-iced. Proven safe when applied to quality concrete surfaces, MELT exhibits the following properties: MELTS DOWN TO -25F: MELT calcium chloride crystals effectively melt ice and snow on contact, even at temperatures as low as -25F. INSTANT HEAT: MELT calcium chloride crystals generate heat instantly upon contact with snow and ice, thereby accelerating the melting process. FAST ACTING: MELT calcium chloride crystals are specially formulated with super-enhanced melting properties to deliver fast and reliable results. MELT 50 Lb. 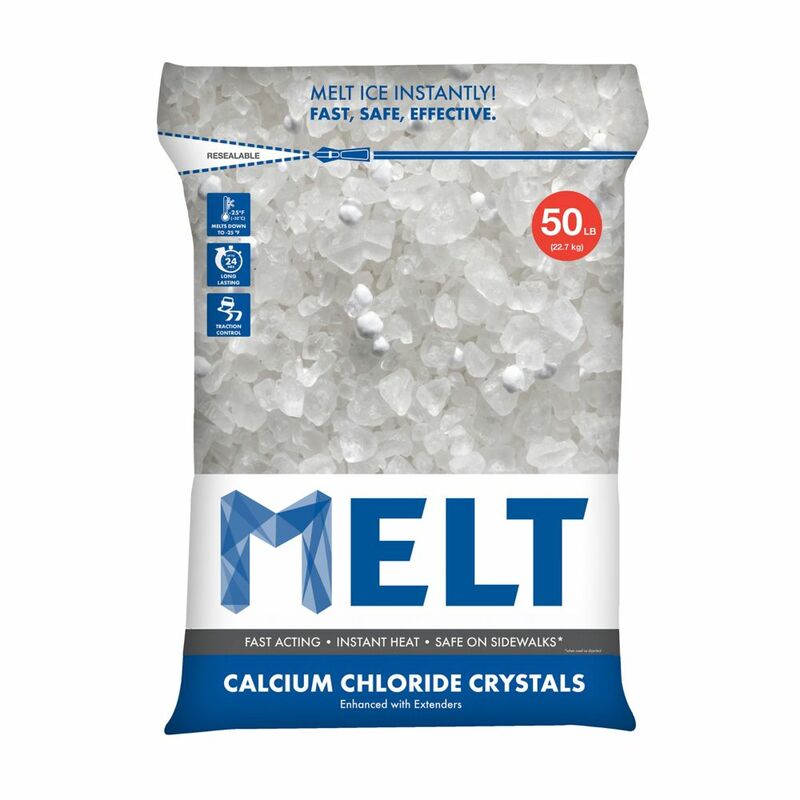 Resealable Bag Calcium Chloride Crystals Ice Melter is rated 4.3 out of 5 by 34. Rated 2 out of 5 by PatentDude from This product is inexpensive, but it does not pack the punch that pure CaCl2 crystals does when it... This product is inexpensive, but it does not pack the punch that pure CaCl2 crystals does when it comes to melting snow. The mix is mostly salt, rather than a majority of CaCl2 pellets that really impact the ice. I found I had to use a considerable amount to apply a texture to the slippery surfaces around my home. Next time, I will purchase the pure Calcium Chloride pellets that run for about twice the price. Rated 4 out of 5 by Unc from PRODUCT WORKED WELL. PRODUCT WORKED WELL. Rated 3 out of 5 by Garin from We bought it because it is suppose to be safer... We bought it because it is suppose to be safer for concrete but we feel the magnesium we had been using works better. Do not like that the crystals don’t dissolve because they drag into the house. Rated 4 out of 5 by HomeDepotCustomer from Worked as expected. Happy with my purchase. ... Worked as expected. Happy with my purchase. Rated 5 out of 5 by CJRT from Melts ice like a boss I've been using this stuff for 3 years. It will melt your ice and it will do it fast. As far as I can tell it has not caused any damage to the driveway, lawn or garden. Rated 5 out of 5 by Keith from Great product. Works well at temperatures at which rock... Great product. Works well at temperatures at which rock salt is useless. Not an issue to use with plants and does not damage concrete. Bought a bag for myself and took one over for my mom. Will buy again. Is this safe for less than a year old stamped concrete? Dear Home Depot Customer, It is not recommended to use the MELT 50 Lb. Resealable Bag Calcium Chloride Crystals Ice Melter on less than a year old stamped concrete. Can I use the melt product on my roof when a very large ice dam and built up? Is this product safe to use on a Interlock (paving stones) driveway?? ?